After a day of exploring Split’s amazing historical center, head towards the harbour, walk towards your right and climb the steps to Marjan Hill for a delicious afternoon coffee break and absolutely spectacular views of Split. I was told the walk up the hill should take about 15-20 minutes. I should have known! The path to the stairs was not very clear and I missed it completely. But, it ended up being a blessing in disguise because my detour took me on a tour of the ancient Veli Varoš quarter. The neighbourhood is said to be one of the oldest suburbs of Split and is a labyrinth of old stone houses, narrow, winding alleyways and small scattered churches. Don’t be afraid to get lost and explore a little because there are delightful surprises to be found around every turn – and the residents are friendly and will give you directions! As I stopped several times to admire an old door, take a photo of someone’s laundry hanging from the window or play with the friendly cats that wandered the streets, it took me closer to 45 minutes to get to the top of the hill. But when I did I was surprised to find a lovely little cafè bar called Teraca Vidilica. Located at Nazorov Prilaz 1, Split 21000, Croatia, this relaxing bar offers breathtaking panoramic views of Split’s city, mountains and harbour. My recommendation: Snag one of the chairs on the patio and park yourself there shortly before sunset. Order your coffee of choice (the iced coffee is delicious and very refreshing on a hot day after the hike up the hill) and watch as Split’s red rooftops and sky magically change colours in the late afternoon sun. After the sun goes down, order up a cocktail and enjoy the same scene transformed by the sparkling lights of the city below – or stay for dinner. Vidilica becomes a full service restaurant offering Dalmatian cuisine. Did you know? Marjan Hill is covered in a dense Mediterranean pine forest and completely surrounded by the city and the sea. In ancient times the Emperor Diocletian built his palace nearby and the park was used for recreation. Today, it is a favorite weekend destination offering several walking, jogging and biking trails. Yeah! I promise you will not be disappointed! I want to visit Croatia so badly!! Go! It’s so amazing. And watch the blog for more amazing Croatia tips coming soon! Thanks so much! Croatia is most definitely Fab! Stay tuned for more Croatia stories coming soon! Ooh I will definitely be pinning this for reference! Can’t wait to visit Croatia! Thank you! Yes, go to Croatia. It’s one of my fave places in Europe! Awesome post! I just was in Croatia (and Venice, Slovenia and Bosnia) on a 15 day driving trip where I told my wife “we’re going somewhere, can’t tell you where, pack for 2 weeks, and it might rain.” Every day was a surprise for her. Croatia was a revelation, neither of us has ever been. I live in the US but have dual nationality with Spain where I lived as a kid. Croatia was equal to any place I’ve been. Looking forward to following your new posts. Check out ours: http://www.topochinesvino.com. Thank you so much! What an amazing thing you did for your wife and an amazing adventure for the two of you. I’m looking forward to reading about your adventures in more detail! What a beautiful view! Even better that you found good coffee at the top! I’m a sucker for a good coffee so I appreciate your find! Croatia really does look amazing. Thanks Juliette! Stick with me kid and I’ll tell you about all my coffee adventures. I’m what you might call “obsessed” with coffee and travel. And yes, Croatia is amazing. If you haven’t been, add it to your list ASAP! Aww I was only in Split for a few hours (more like Trogir) for Yacht Week and really wish we had more time to explore it!! 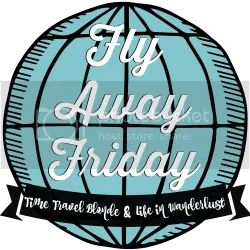 Thank you for sharing on FlyAwayFriday! Ahhh, I loved Trogir as well. Such a charming little town! I’d love to go back and do Yacht Week! We are going to Split this year. Can you recommend a quiet part to stay in near the sea, not too far from the town at all where jogging might be possible?